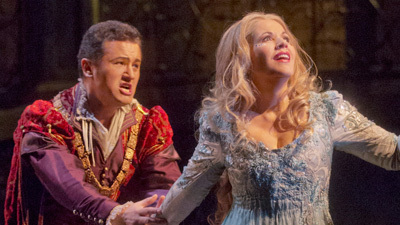 Superstar Renée Fleming lavishes her warm, golden voice and appealing stage presence on the title role of the water nymph who falls in love with a human being—with tragic results for both of them. It is Jezibaba the witch (Stephanie Blythe) whose magic turns Rusalka from a sprite into a woman on the condition she not speak, and that her love, the Prince (Aleksandrs Antonenko), remain true to her. Christine Goerke is the jealous foreign Princess who ruins everything for the two lovers. With Kristinn Sigmundsson as the Gnome. Jirí Belohlávek conducts.